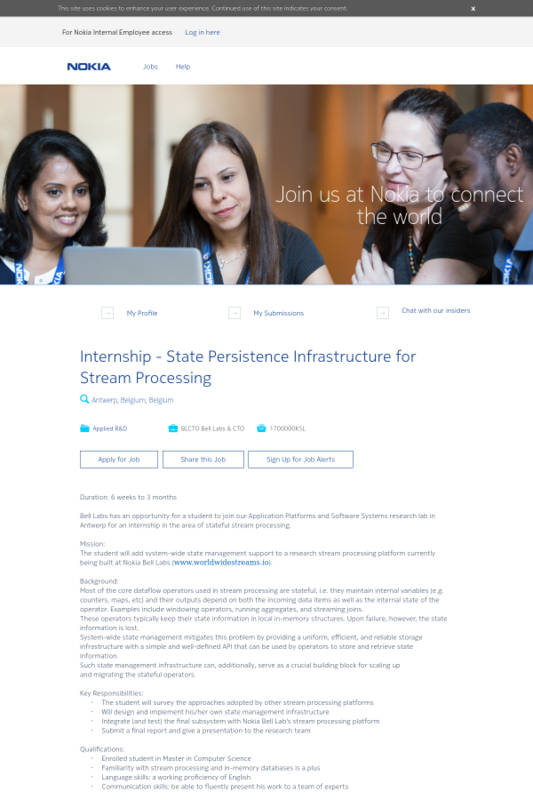 Bell Labs has an opportunity for a student to join our Application Platforms and Software Systems research lab in Antwerp for an internship in the area of stateful stream processing. The student will add system-wide state management support to a research stream processing platform currently being built at Nokia Bell Labs (www.worldwidestreams.io). Most of the core dataflow operators used in stream processing are stateful, i.e. they maintain internal variables (e.g. counters, maps, etc) and their outputs depend on both the incoming data items as well as the internal state of the operator. Examples include windowing operators, running aggregates, and streaming joins. These operators typically keep their state information in local in-memory structures. Upon failure, however, the state information is lost. System-wide state management mitigates this problem by providing a uniform, efficient, and reliable storage infrastructure with a simple and well-defined API that can be used by operators to store and retrieve state information. Such state management infrastructure can, additionally, serve as a crucial building block for scaling up and migrating the stateful operators.